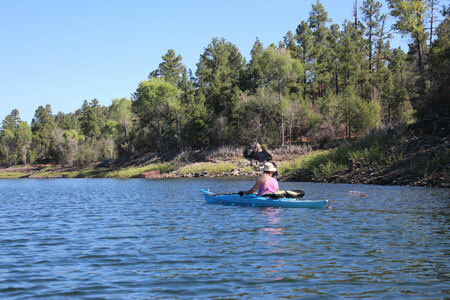 In August, we had the opportunity to visit the Prescott area for the 1st time and paddle two of the lakes in the area. Tyler Williams in his paddling guide, "Paddling Arizona", describes Watson Lake as being one of the "Granite Lakes", from the maze of boulders that not only form the shoreline but rise up through the waters in many other places. He describes Lynx Lake as being one of the "Pine Tree Lakes". It resembles more nearly the other mountain lakes seen around the state with its shoreline of grass and tall pine trees. 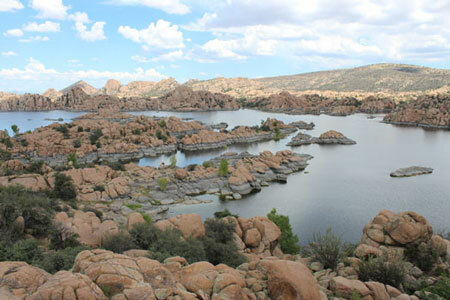 There are several other lakes in the Prescott area, but these two are the largest. Watson Lake can occupy a space of 200 acres when full while Lynx Lake is quite a bit smaller at 60 acres. 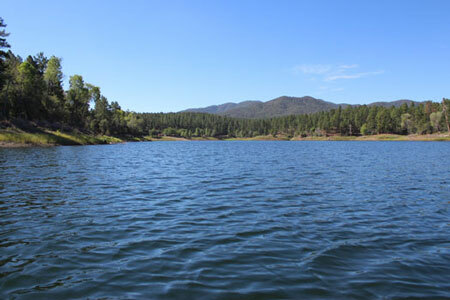 Both of the lakes are managed as recreational reservoirs with Watson being part of the Prescott City Parks system. Lynx Lake is a National Forest lake. Motorized boat traffic is allowed on Watson Lake, but the entire lake is under a no-wake zone. Only electric motors are allowed on Lynx Lake. Just as the character of Watson Lake is different from Lynx Lake, the northern half of Watson is different from its southern half. The northern half has the many fingers and coves within the maze of granite boulders. The southern half is very wide and open with few of the boulders. There are two launch ramps, one in the northern portion of the lake and the other in the southern portion. We launched at the southern ramp and paddled north. That end of the lake seemed more interesting. It was great fun paddling out to the ends of the coves and threading our way through the watery passageways. The scenery of the granite boulders, with the clouds and water was outstanding! Williams describes Watson Lake as the "crown jewel of the area lakes". From a paddlers standpoint, we would certainly have to agree! In August of 2013, the paddling on Lynx Lake was pretty straightforward. It was essentially out and back. Perhaps, because of the lower water level there were few coves or fingers to explore. The lake is in a very scenic setting surrounded on all sides by tall pine trees. It is very much quieter here than at Watson Lake. There, heavy highway traffic noise intrudes on the experience. One older gentleman told me that he prefers paddling on Lynx Lake because his Golden Age card allows him to paddle for free. If he were to paddle at Watson Lake, he would have to pay the $2 daily use fee. There is a very nice picnic area near the launch ramp. The campgrounds are a bit further away.